Excellent pro-level collection - others may want to wait for the Compact edition. Beautifully recorded selection of global instruments. Some odd omissions, too massive for many. Best Service's vast World Percussion comes supplied on a USB drive. 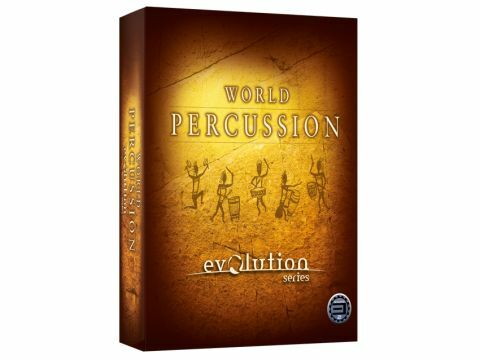 World Percussion is quick to get going with and boasts fantastic sound quality. At over 200GB, this is among the largest ROMplers we've encountered, and even more extraordinary is that it's devoted entirely to percussion. It uses the Engine sample playback engine and is supplied on a USB hard drive (you have to install it on a local drive, though). "World Percussion is beautifully recorded, and the detailed sampling makes the instruments feel natural, responsive and 'alive'." So why's it so massive? Well, Best Service has recorded over 80 instruments, with multiple articulations, up to seven mics, multiple velocity layers and up to ten round-robin alternates per sample. Of the latter, you can opt to load two or five instead (to save system resources), and you can load two, three or five mics for stereo use. Faders balance the mics in the custom Quick Edit view, along with level, pan, tuning and convolution reverb. For surround, you can load three or seven mics. The instruments are from Africa, the Middle East, Asia, Europe and South America, including djembes, tuned percussion (eg, balafon), a talking drum, six gamelan instruments, finger bells and congas. It's beautifully recorded, and the detailed sampling makes the instruments feel natural, responsive and 'alive'. There are velocity-sensitive MIDI grooves mapped to the lower octaves too, for instant inspiration. Whether you use those or create beats by hand, it's hard not to hit upon the beginnings of an evocative film score, a dramatic bed, or even a pulsing loop to underpin a dance track. It's inspiring and easy to get going with - for pro composers, such factors may be as vital as the movie-ready sound quality. The only criticism is that the selection isn't exhaustive. The European section is notably skimpy, with four snares, timpani and bass drum - they're brilliantly bombastic, but you'll need to go elsewhere for cymbals, xylophone, etc. And there's no cuíca in the South American folder! World Percussion is superb, but at this price, it's mainly for pro composers with RAM-stuffed computers. The good news is that a 7GB Compact edition is out imminently, priced £175.